At bright Forever we help companies to grow their business through live marketing events such as trade shows, road shows, exhibitions and conferences. With our proven 5 step system to trade show success our customers are able to perform more effective and efficient at the events so they create ROI were they normally only see cost. What is your marketing target and budget? How do you want your clients to perceive you and your company? How can you demonstrate your product or service in an entertaining way? What theme could fit well with you, your company and your product? How can you identify your target audience quickly? What are the biggest frustrations and fears of your clients? What questions to ask so you understand their needs better? How do you segregate leads? How do you follow up with the different leads and when? What information do you need from potential clients to allow you to connect with them? How did your event go and what was the feedback from your clients? How many leads did you generate and what was the quality of the leads? What went well and what can be improved upon for the next event? How prepared are you for your next event? During this 1 hr session we will evaluate your past or upcoming Trade Show(s) AND you will receive a scorecard and report with action points to prepare better for your next event. After filling out this form you will be redirected to a booking calendar to schedule an appointment at your preferred day and time. Book an evaluation or contact us now! 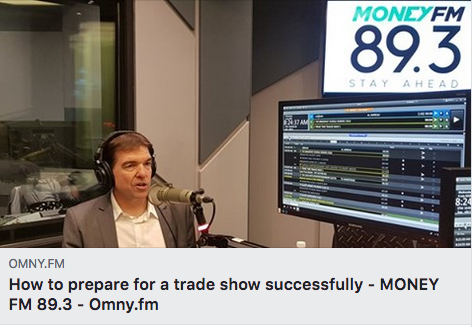 At the beginning of July I had the privilege of being interviewed by the Money FM team. This is the podcast, talking about trade shows and how to improve your performance.